Geoffrey W. Coates, the Tisch University Professor in the Department of Chemistry and Chemical Biology, has received the 2017 Newcomb Cleveland Prize of the American Association for the Advancement of Science (AAAS) for the best paper published in Science each year. Papers are chosen based on scholarship, innovation, presentation, likelihood of influencing the field, and wider interdisciplinary significance. The prize includes a medal and $25,000, and will be presented on Feb. 15 at the 184th AAAS Annual Meeting in Austin, Texas to the paper’s authors: Coates, Anne LaPointe, research associate in chemistry; former Cornell postdocts James Eagan and Rocco Di Girolamo; Jun Xu, Christopher M. Thurber, Christopher W. Macosko, and Frank S. Bates. Coates and his colleagues received the award for their paper, “Combining polyethylene and polypropylene: Enhanced performance with PE/iPP multiblock polymers” published in Science on Feb. 24, 2017. The paper describes the development of a new additive that helps meld incompatible types of plastic together, which holds important implications for recycling. These types of plastic -- polyethylene and polypropylene –make up two-thirds of the world’s plastics, but differences in their chemical structures have prevented them from being recycled together. The research group has designed a multi-block polymer that can combine these two materials into a single plastic composite. According to Coates, this new material is both rigid and mechanically tough, which could lead to innovations in the way that plastic products are designed as well as to more efficient recycling of plastic waste. Coates’ teaching and research interests involve science at the interface of organic, inorganic and materials chemistry. 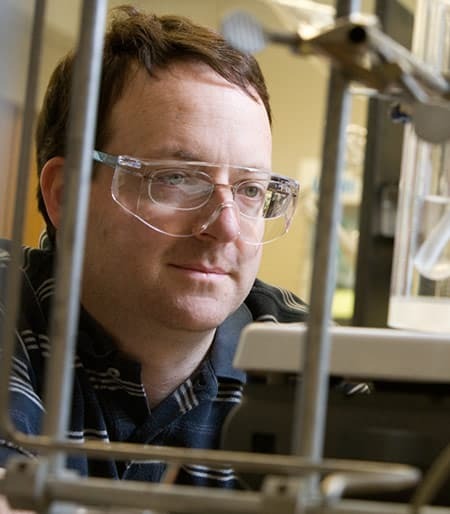 The broader impacts of his research include benign polymers and chemical synthesis, the use of renewable resources, and economical energy storage and conversion; the Coates Research Group focuses on the development of new synthetic strategies for producing polymers of defined structure. After receiving his bachelor’s in chemistry from Wabash College in 1989, Coates received his doctorate in organic chemistry from Stanford University in 1994. He joined the Cornell faculty in 1997, and was named the first Tisch University Professor in 2008..
A member of the National Academy of Sciences, the American Academy of Arts and Sciences and the National Academy of Inventors, Coates has received numerous awards, including the A.C. Cope Scholar Award and the Affordable Green Chemistry Award from the American Chemical Society.